"Go Cubs Go" may have finally met its match. In the fall of 2016, just before life-long Chicagoan, WWII veteran, musician, and retired city employee Pasquale "P.J." Panico passed away at the age of 95, his grandson found something special. "I was gathering up his old records for safe keeping and one was clearly not commercially produced," says Robert Sarwark, 35, now a resident of Atlanta, Georgia. "As I uncovered it, I saw that it was a 78rpm demo record that had the words 'Cubs Song' written on the label. My grandpa's name and another guy's name, Paul Geallis [a family friend who passed away in 2012], were also both written on it. No one else in my family had ever heard it -- or of it -- before." About two months later, while playing that mysterious 78rpm record on a portable turntable at P.J. 's wake, Sarwark realized that this was not just any demo: it was a zippy Chicago Cubs booster song that had lain forgotten for close to sixty years. Just over a week later, on November 2nd, 2016, the Cubs won the World Series for the first time in 108 years. "Once we heard the tune, which, based on the lyrics, we dubbed 'Come Out to Wrigley Field (The Home of the Cubs),' we knew we had something very special," adds Sarwark. "We have very little background information about the recording. But my family members and I knew right away that it was P.J. singing and playing accordion, probably in the late 1950s or early '60s. And we knew that we had to preserve it." Preserve it he has. With the support of his parents, siblings, aunts, uncles, and cousins, Sarwark first sought the expertise of a tech-savvy friend to digitally transfer the analog track from vinyl. He then quietly released the short tune (only 01:30 long) on the main digital-music outlets, so friends and family could enjoy it. 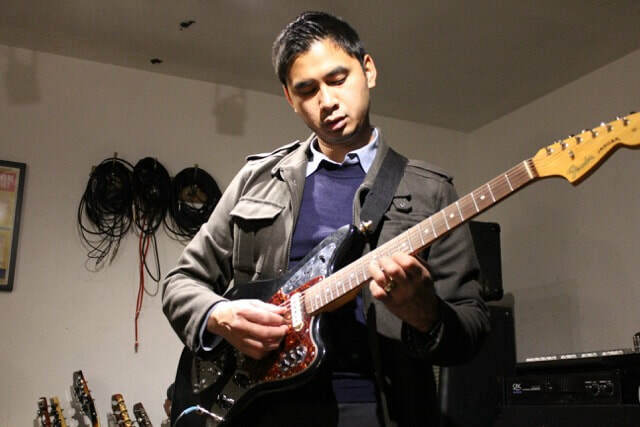 But with the help of Steven Serra, owner of Small House Studios in Palatine, Illinois, Sarwark hopes to bring the song to even greater exposure. "Steven is the best all-around musician and producer that I know," says Sarwark, who played in bands with Serra starting when they were teenagers. "He can write and play in any style. And he is a wizard in the studio. He was my go-to for the original digital transfer, and he was my go-to to help update my grandfather's song for the twenty-first century." With Sarwark managing the general business operations and Serra taking the helm in the studio, the two are happy to announce a special-edition release of two new versions of "Come Out to Wrigley Field." 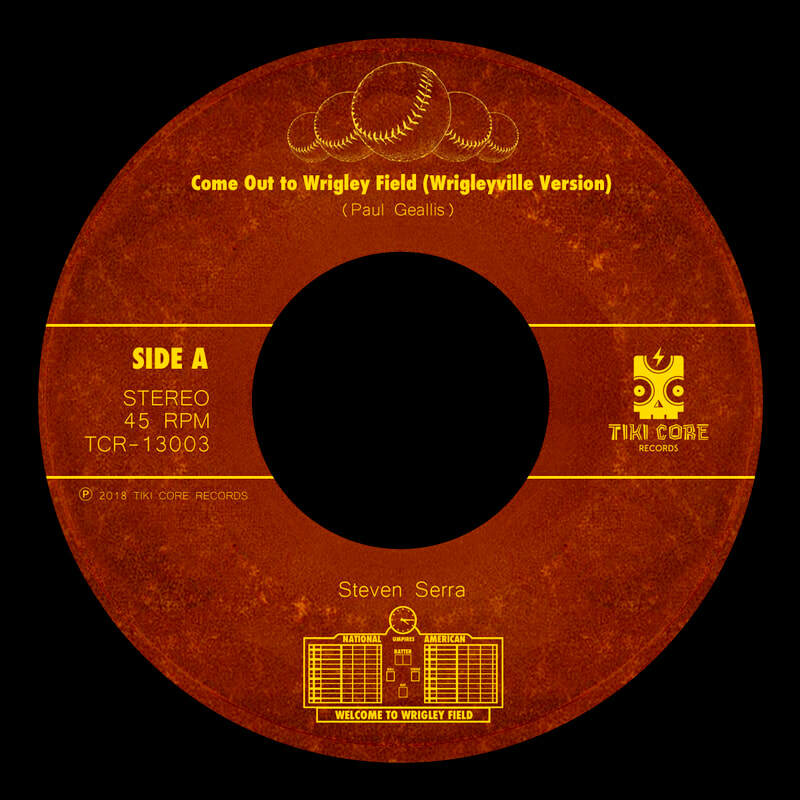 Pressed on "Cubbie Blue" vinyl, this 7" (45rpm) record commemorates the history, fun, and magic of the friendly confines of Chicago's Wrigley Field while also honoring the unsung talents of P.J. Panico and Paul Geallis. Released exclusively by Tiki Core Records, a label co-founded by Robert Sarwark and Montreal-based musician Andrew Joncas, the collectible record was manufactured in a limited run of only 300 copies and is available at tikicore.com. Each side presents a distinct version of Panico and Geallis' rediscovered tune. Side A is Chicago-style bluesy rock ("Wrigleyville Version," 02:58) and Side B is old-timey dixieland jazz ("Old Town Version"). In addition to producing and mixing, the multi-talented Steven Serra sings both lead and backing vocals and plays almost all featured instruments on both tracks; Matthew Beck (clarinet) and Christopher Rice (double bass) are featured guests on the "Old Town Version." P.J. Panico, though a long-time resident of the Dunning neighborhood on Chicago's northwest side, was born and raised in Little Italy, south of I-290. In other words, he had actually always been a White Sox fan. "I hope he can forgive me," says Sarwark, jokingly. "But it's just too good of a song to keep hidden from the world. My goal is for it to be played at Wrigley Field itself by the start of the 2019 regular season." For more information, please contact Robert Sarwark at tikicorerecords@gmail.com or by phone at 773-609-5866. Photo of Steven Serra © Lyra Serra. Label artwork by Andrew Joncas.